March’s Community Meeting was an exciting one! Our special guest of the evening was Jenny Dewitt, social media manager of the University of Central Florida (UCF). Jenny talked to us about her experience in her career as a social media manager. She also gave us insight on how to have a successful presence on social platforms. One of her main points of the night was that “Communication channels that talk with audiences significantly out-perform those that talk at audiences”. It is important as a social media manager to truly know and understand your audience. When we post things that tend to talk at our followers, it doesn’t translate as well as it would if we were to simply talk with them. It is equally as important to have social platforms where our audience can express themselves freely. As Jenny explained, her target audience is the students of UCF, so she uses social media as her main platform to reach her audience. It has been commonly used as an emotional outlet that allows students to easily express themselves. Another key point that she stressed was that networking is key. Networking is vital to creating a strong social presence. Once you establish yourself socially, you create credibility among others, and can be seen as a reliable source of information. She also expressed how having a strong team helps to create a greater outcome. It is virtually impossible for her to be everywhere she needs to be at once, but with a team, she can get a lot more done. AIGA Orlando puts on a lot of events, so it helps for the social media team to get assistance from the entire board with creating content to put together these events. Not only is social presence important, but also what we represent as a whole, and what messages we portray with this presence and its power. AIGA Orlando makes an effort to keep the creators of the community informed by posting about different events and opportunities for artists to contribute in different creative ways. So it is important for us to maintain a positive image with the information that we put out. Before closing, Jenny gave us 4 key tips to keep in mind: be valuable, clever, gracious, and dramatic. Always remember to bring value to your audience by bringing something unique that everyone can utilize in some way. Optimize your resources, and never miss an opportunity to build your network. Be clever in your team building and maintain a positive social presence at all times. Always thank your audience and those who contributed and collaborated to create your vision. Remember that most viewers decide after 2 seconds if they want to continue to engage in your content, so it is important to catch their attention quickly in a dramatic way. Live streaming and eye catching thumbnails are a great start. Overall, Jenny came with tons of eye-opening insights and really expressed the importance of working together as a team to inform the creative community of AIGA Orlando. 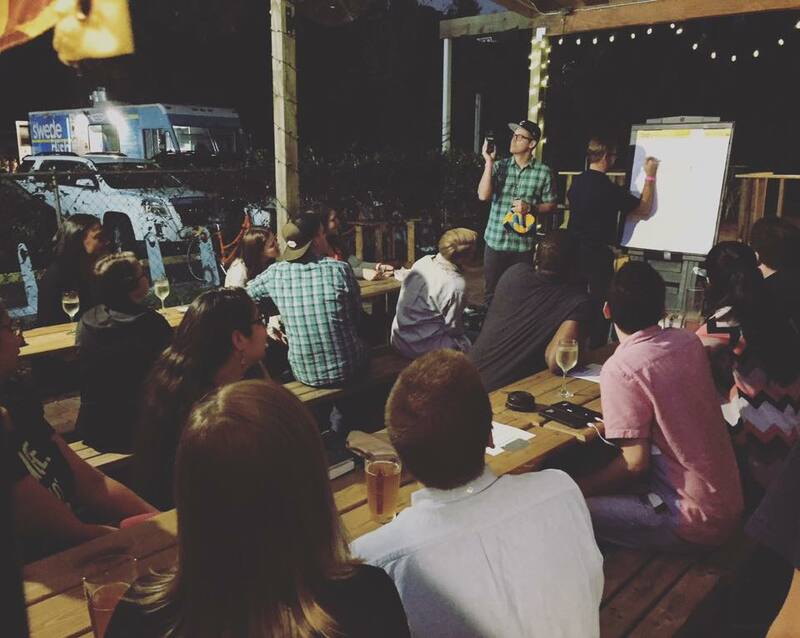 We recently got together for another Drink and Draw at Barley and Vine Biergarten. Thanks to all who joined us. We hope you have as much fun as we did! How do five very different women approach leadership at five very different organizations? Find out at this candid Q&A. We’ll explore all the ins and outs of effective leadership. How do you establish yourself as a potential leader? How do you navigate office politics? What inspires the best from your team? How much does your personality define your leadership style? The answers will be different for everyone, and the insights are sure to inspire us all. More information here.